geminibodyjewelleryuk has no other items for sale. By Purchasing from us you are agreeing to our terms and conditions, Shipping policies and Returns policy. It is our responsibility to provide our customers with as much information about the product within the title description and picture to help the customer make a proper informed decision about the item they are about to purchase. 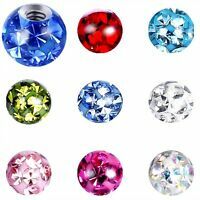 It is the customers responsibility to ensure they purchase the correct item for their piercing needs this includes sizes/measurement, colour, material etc Please remember we are here to help and we don't bite so ask any questions anytime. Item as described, happy buyer.